Nothing quite beats seafood fresh from the ocean. Even in its plainest form, this straight-from-the-sea delicacy goes unmatched. Though, when spruced up with some herbs and sauces, seafood can be taken to another level. Today, our Virginia Beach restaurant thought we’d discuss some of the ways that you could get uber creative with seafood. Some sorry souls out there really don’t think that they’re into seafood, but we’re here to prove them wrong with these sneaky seafood creations. Sit back, read on, and start making dinner plans to come to FireBrew Bar & Grill. Tacos are a beloved food group loved by every genre of people. There are a million ways to make tacos and a million ingredients to make them with. 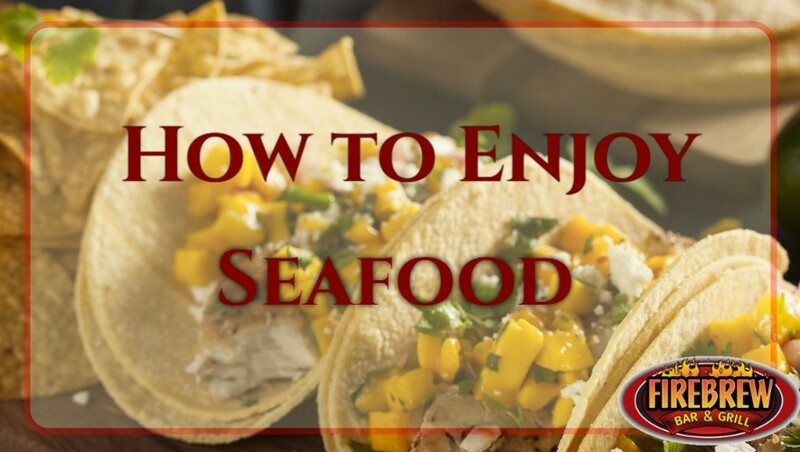 One of the more popular taco formations that have been taking over the western hemisphere has been seafood inspired tacos. We’ve seen shrimp tacos, we’ve seen Mahi tacos, we’ve seen crab tacos. None of which fails to satisfy so as long as they’re constructed with seafood fresh out of the ocean and with toppings that aren’t frozen. Seafood naysayers, have you tried this? Sure, you don’t want to eat seafood in its plainest form, but how about if it’s boiled in with other yummy foods and served in a bowl? You’ll get the best flavors from the seafood, whether it be crab, clams, or lobster, but without having to look at it. People have their issues, and we think it’s best to qualm them with a bowl of soup. Oh yes, we went there. Only people who can’t be trusted aren’t into ‘dillas, and we think that if you’re reluctant to eat pure seafood, try disguising it as a quesadilla filling. Not only is it still as delicious, but when combined with a specific set of ingredients, sauces, and cheese, some shellfish sitting inside a toasted tortilla is going to be far from disappointing. Sneaky, sneaky seafood over here. Give our seafood quesadilla a shot and TRY to tell us that you’re not a seafood person. We here at FireBrew Bar & Grill don’t mess around with seafood or burgers. Therefore, if you’re not too sure about where you stand with seafood and need a little nudge, try out a salmon burger. “Salmon? Really? Get out of here with that fishy business!” you may say. “Just try it!” we respond. After a bit of back and forth, you finally take a bite and the rest is history! Salmon as a burger filling is a great and healthy alternative to your standard burger patty. If you’re thinking that this fish will effectively ruin the burger, you’re wrong, as long as you’re not getting it from the wrong place. Seafood skeptics, fear not. Our restaurant here in Virginia Beach has all of the tools to make you a believer. Stop by FireBrew Bar & Grill today for some excellent seafood dishes! We’re excited to have you!